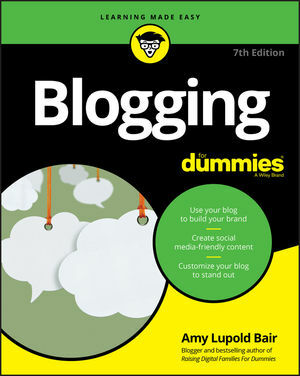 The bestselling blogging book—updated in a new edition! Ready to make your mark on the online world? Start a blog! Blogging For Dummies provides you with information on blogging basics, the anatomy of a good blog, and the tools required to get started. Plus, you'll get advice on a blog topic, choosing a domain name and host, writing your first post, planning an editorial calendar, and using your blog as an important part of your personal brand. Covering shifts in popular blogging platforms and tools, changes in social media, and the latest best practices in the blogosphere, this new edition sets you up for blogging success! Amy Lupold Bair (Olney, MD) is the founder of Resourceful Mommy Media, LLC, and former owner and author of the popular parenting and lifestyle blog, Resourceful Mommy. In 2008, Amy invented the social media marketing tool, the Twitter Party, and in early 2009, she created the Global Influence Network for bloggers. A former English teacher and mother of two, Amy is also the author of Raising Digital Families For Dummies, a guide for parents raising digital natives.